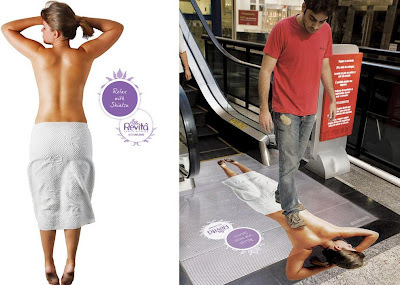 Clever uses of escalators in advertising by various companies from all over the world. 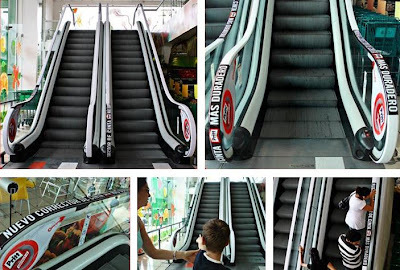 Demolicion Magazine Escalator Advertisement: Surfboard shaped floor stickers were placed on the moving walkways to promote extreme sports magazine 'Demolicion'. Venus Escalator Advertisement: A huge leg was installed on the escalator creating an illusion that people holding the handrail were running their hands down the smooth leg, demonstrating to the commuters the smooth benefits of Gillette Venus. 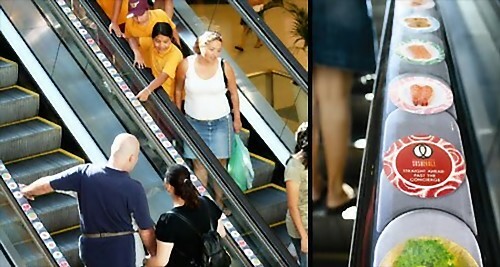 Pritt Escalator Advertisement: To promote its new correction tape and display its durability, escalator handrails at various shopping centers mimicked the endless correction tape. 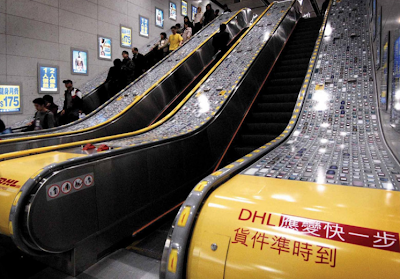 DHL Escalator Advertisement: This creative escalator advertisement demonstrates DHL's inexplicable ability to reach on time regardless of conditions. 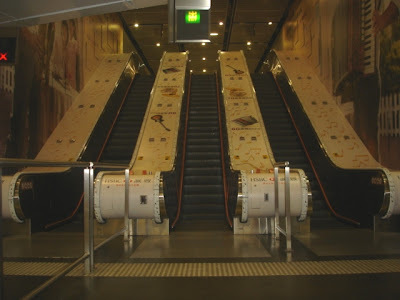 The areas on either side and between the escalators were covered with huge bird's-eye view of Hong Kong highway with stationary vehicles; and the moving handrails then acted as a fast lane with a steady flow of little yellow DHL vans racing past. 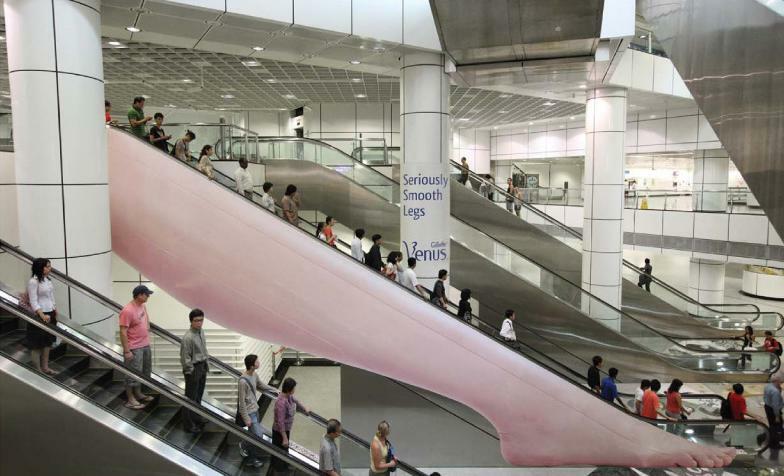 Revita Escalator Advertisement: Creative escalator advertisement for Revita beauty center. 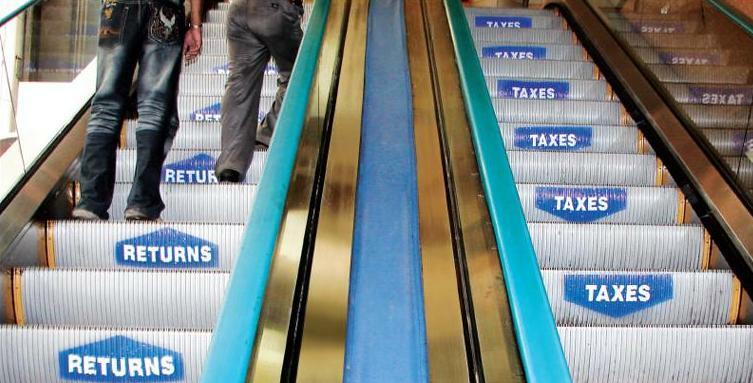 Tata Mutual Fund Escalator Advertisement: This cool escalator advertisement of Tata Tax Saving Fund creatively displays the dual benefit of lower taxes and higher returns. 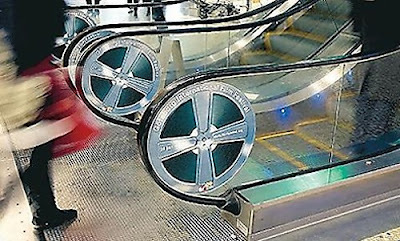 Film Festival Escalator Advertisement: Escalators were turned into rolls of film with strategically placed stickers, to remind viewers about the Gothenburg International Film Festival. Sushi Roll Escalator Advertisement: This one cleverly uses the handrails of the escalator to create a sushi train. 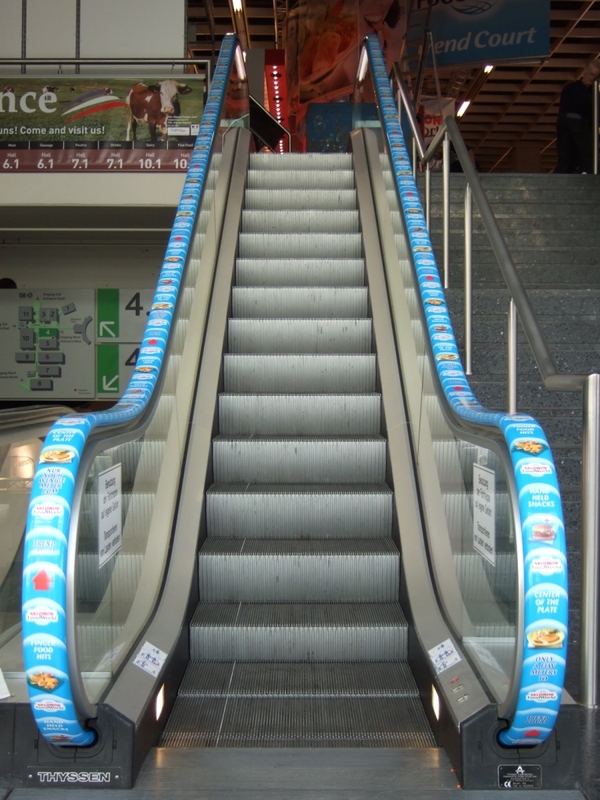 Food Court Escalator Advertisement: A creative use of escalator handrails for advertisement by Food Court to promote its products.